We continuously asked Stelligent to approach certain requirements in a unique way that made sense for our company and business model. They were incredibly resilient to that and were able to be flexible and adapt to the requirements we had that were different. Arc Publishing is an award-winning, state-of-the-art digital platform and suite of tools that’s engineered to meet the needs of modern publishers. Built by engineers and designers at The Washington Post, Arc technology handles complex publishing and audience needs across video, web, apps, subscriptions, and ad monetization, providing a competitive advantage enhanced by a set of sophisticated machine learning and AI-powered tools. Arc has powered the digital transformation of clients both large and small across the globe. At its core, Arc is about speed and innovation: for readers, newsrooms, brands, advertisers, and developers. Founded in 1877, The Washington Post is a nationally and an internationally renowned news publisher. Known for its commitment to political journalism and international coverage with 24 correspondents in 18 bureaus around the world, The Post’s mission is to serve as the first place readers turn for breaking news and investigative journalism. Teams across The Post, from its leadership to the newsroom to engineering, understand the company must evolve in the ways its readers demand to efficiently deliver stories that matter. A critical step for The Post has been its embrace of digital technologies to drive journalistic excellence and improve the overall experience of its readers. In practice, The Post differentiates itself as a technological innovator in the publishing industry by taking an autonomous approach to software development, allowing teams across the organization to build, experiment, and launch products with low central oversight, and by forging a strong partnership between its newsroom and technology teams. Looking to drive agility and innovation throughout the organization, The Post chose to build its internal Arc platform on Amazon Web Services (AWS) and transform its architecture from a monolithic Content Management System (CMS) design to a microservices-based design. “One of the main motivations for moving to AWS was the agility we gained for the people trying to build custom software and then iterate on it very quickly. And the microservices approach we decided to take was a natural evolution from our focus on agility and innovation. That’s what worked well for our teams,” says Cullen. By moving to a microservices architecture on AWS, engineers at The Post were emboldened to iterate on products quickly to reduce lead time and tighten the feedback loop to continue improving products. A focus on quick iteration and continuous innovation helped the company thrive in a challenging market.The Post's software engineering team realized the lessons learned in developing the Arc platform and the investment made by The Post to build the technology from scratch could bring numerous benefits to digital publishing companies around the world as a software as a service (SaaS) solution. Given the nature of its work, The Post has critical data security, privacy, and availability requirements and knows its Arc Publishing clientele share the same requirements and concern. The engineering team at The Post approached security, privacy, and availability as a fundamental part of the Arc Publishing architecture design in addition to the focus on innovation and agility. As the Arc Publishing product portfolio grew and more customers on-boarded to the platform, the team looked at how they could maintain agility and innovation by runing on AWS while increasing the level of governance in the AWS environment. To address this challenge, The Post turned to AWS Partner Network (APN) Premier Consulting Partner and AWS DevOps Competency Partner Stelligent. The Stelligent team held an interactive lunch-and-learn session with The Post’s engineering team. Soon after that, Stelligent quickly got to work helping The Post re-design their architecture on AWS. The Post’s engineering team found enormous benefit engaging an AWS DevOps Competency Partner like Stelligent. “We already had pretty deep AWS expertise on our team. But seeing the technical depth Stelligent possessed in our initial lunch-and-learn, we could tell their expertise in DevOps automation went far deeper than ours,” says Cullen. “It was obvious their team was doing some innovative work on AWS, such as open sourcing some of the technologies they’d built, such as Stelligent’s cfn_nag and Stelligent mu, to push the envelope concerning what you could do with automation. That got us excited about working with them." 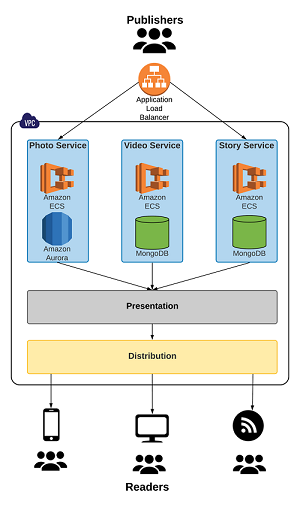 Arc Publishing delivers a similar end-user experience as traditional Content Management Systems (CMS), but the Arc platform architecture on AWS is built very differently from a traditional CMS architecture. The Arc Publishing platform supports over 50 deployments per hour, across 100 unique microservices. In its infrastructure, Arc uses hundreds of Amazon Elastic Container Service (Amazon ECS) instances and many thousands of Docker containers. By taking a microservices approach to developing Arc Publishing on AWS, The Washington Post has been able to keep its teams small and agile while enabling them to make decisions quickly. Stelligent has played a vital part in the evolution of the Arc platform on AWS. Stelligent, a professional services and consulting firm with deep expertise in DevOps automation services on AWS, enables security-conscious enterprises to focus on developing software users love by leveraging automation on AWS. Its goal is to work closely with customers to develop fundamentally secure infrastructure automation code, deployment pipelines, and feedback mechanisms for faster, more consistent software and infrastructure deployments. As an AWS Partner Network (APN) Premier Consulting Partner, AWS Public Sector Partner, and AWS DevOps and Financial Services Competency holder, Stelligent uses its expertise to help customers benefit from continuous AWS innovation. For more information, contact Stelligent through its listing on the APN Partner Solution Finder or on their website.